I recently took a look at a Harley-Davidson Electra Glide Ultra Classic motorcycle while visiting my local Harley showroom here in New Jersey. I should have taken a photo of the two-up seat because that’s as close to a living room as I have seen on a motorcycle. The photo that accompanies this article is of a Harley-Davidson Electra Glide Ultra Classic cockpit. There are two excellent locations for mounting a device in the handlebar and clutch. That’s typical for many Harley models. While I suppose we could also go with a gas tank mount, I think it would look awkward so I won’t recommend that location. The diameter of the Harley-Davidson Electra Glide Ultra Classic handlebar is a standard 1.25 inches. There isn’t as much real estate on either side of the handlebar for mounting and I think that placing it on the vertical positioning will work best. The mount needs to have a ball and socket design to ensure it can bend upwards at a 90 degree angle. For the clutch, the bolts are clearly accessible. It’s a little more difficult of a mounting job, but some prefer that location instead. Just need to ensure that the mounted device doesn’t get in the way of the mirrors. More people are using a smartphone for navigation and other purposes these days, so let’s start with those types of mounts. By the way, if you haven’t tried it, check out our Waze review. It’s the best GPS app out there. It’s also free. Be sure to use a case like an Otterbox Defender or LifeProof case to protect your phone against road debris. The small investment will help to protect against potential damage to your expensive phone and it’s worth the small investment. Make sure the selected mount holds your phone tightly and can withstand the rigors of a vibrating motorcycle. The RAM X-Grip line of mounts continues to a be a favorite for motorcycle use. Most smartphones, especially with a case or skin, can use the RAM X-Grip IV Handlebar Mount. These metal mounts are heavy duty and come with a lifetime warranty. Featuring the expandable X-Grip IV cradle, these open to 4.5 inches which is large enough for almost any phone. This mount attaches to the handlebar and allows complete 360 degree rotation. Use the included safety tether for added security. A very detailed article on the X-Grip series can be read here. A similar selection but for a different mounting location is the RAM Brake/Clutch Reservoir Mount with Universal X-Grip IV Phone Cradle. This mount includes a set of bolts to replace the factory ones that came with your Harley-Davidson Electra Glide Ultra. They are a little longer than the original bolts to accommodate the added length of the mounting post. These are a bit more difficult to install than a handlebar mount. Be sure to follow the directions and use a mechanic if not comfortable working on your motorcycle. This included cradle opens to 4.5 inches. The mount has a lifetime warranty. Most GPS owners are using a Garmin GPS. Either a Garmin Zumo or one of the car models like a Garmin Drive. The Zumo includes a RAM motorcycle mount that will attach to a handlebar or clutch. The Garmin Drive uses a cradle with a 17mm socket on the back. You will use a mount that has a 17mm ball on it. We recommend tethering the GPS to your handlebar if possible for added safety. A good handlebar mount that’s been around for a while is the Arkon Premium Aluminum Motorcycle Garmin GPS Motorcycle Mount. These will fit the Harley-Davidson Electra Glide Ultra Classic handlebar. It has a 17mm ball on the end that fits a Garmin Nuvi or Garmin Drive’s socket on the back of the cradle. It’s made of metal and installs with an included hex wrench. The GPS will be mounted on the vertical part of the exposed handlebar. Keep the wrench in the saddlebag when finished because you will lose it if thrown into your garage toolbox. This mount has a 2-year warranty. The clutch is a good spot for a GPS too. Techmount manufactures a well made Harley-Davidson and Metric Control Mount Kit that features a 17mm ball. That’s the size ball needed for this application. This mount comes with stainless steel bolts that will replace the current manufacturer bolts. If you would like to mount a phone, add the Techmount TechGripper Cradle. Add the cradle when you want to use it for your phone. Remove the cradle when it’s time for a GPS. There are even several inexpensive adapters that permit the installation of cameras or even specialized adapters for the ever popular GoPro series. 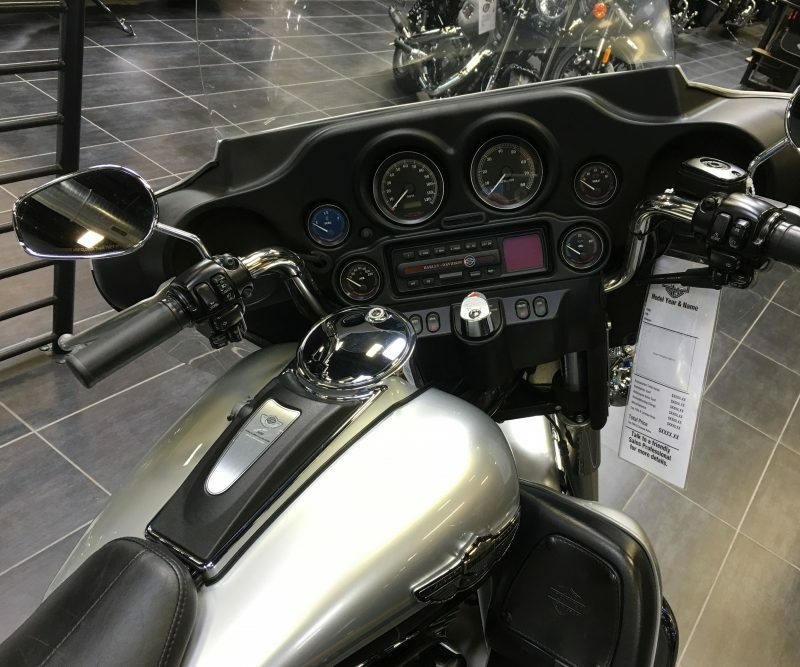 Due to the presence and location of the dash and windscreen, I don’t think there is a good place to mount a camera on a Harley-Davidson Electra Glide Ultra Classic. I suppose one could use a mount with a very long arm that extends above the dash and windscreen but think it’s going to be awkward looking.